CORAL GABLES, Fla. (Dec. 30, 2017) – Lily May Humphreys watched her first putt Saturday spin out so hard it came to rest six feet from the cup. A birdie chance wound up turning into a bogey. One hole later, Humphreys’ birdie attempt did a hard horseshoe back at her.There’s stroking it with authority, but this was a little much. “I was just trying to hit everything with confidence – but it needed to go in the middle for it to fall in,” said the English teen, who found herself 2-over par through her first four holes on the final day of the 54th Junior Orange Bowl International. Fortunately for Humphreys, she had plenty of cushion to work with. And once she regained her touch, there was nothing to stand in the way of a record performance – finishing nine shots clear of her nearest pursuers at the historic Biltmore Golf Course. Jerry Ji captured the boys’ title in similarly comfortable fashion, holding steady as France’s Pierre Pineau waged a brief challenge before falling away for an eventual seven-stroke margin of victory. The European duo became the newest additions to to a champions list that includes Tiger Woods, LPGA Hall of Famer Inbee Park and such other future major champions as Mark Calcavecchia, Cristie Kerr, Lexi Thompson and Brooke Henderson. “I just hope I can follow in their footsteps,” said Humphreys, 15, who already has built an impressive junior portfolio in Europe but was making her first competitive venture to the United States. 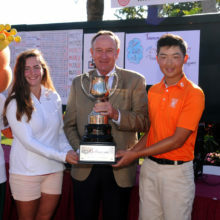 For Ji, the Junior Orange Bowl International marks his first international victory after a series of close calls. Intermittent clouds and northerly breezes created chilly conditions for golfers on Saturday, a stark contrast to the first three days when temperatures rose into the 80s. Ji’s 70 made him one of just 12 boys to break par in the final round; none of the girls managed that. “The score wasn’t that bad, all things considered,” said Humphreys, whose 2-over-par 73 was four shots higher than anything else she recorded on the week. Had her chip shot at No.18 managed to fall in the hole for eagle – it stopped less than a foot away – Humphreys still would have been the first girls’ champion to finish at double digits under par. As it was, her total of 9-under 275 was two shots better than Somi Lee’s previous standard established just last year. For Humphreys, it’s her first tournament record. She’ll add the JOBI title to five others she’s won in 2017, including the English Women’s Amateur, European Young Masters, Henry Cooper Masters and Girls’ British Open. She also notched four victories in 2016. The frustration came to a head after another power lipout at No.8, her par attempt rolling away 8 feet from the cup. “I said to myself, ‘You’re hitting everything way too hard. Just slow down,’ ” she recalled. She made the comebacker to save bogey, then didn’t card another bogey the rest of the way. Japan’s Miyu Goto (72) claimed second at even-par 284, one stroke ahead of Mexico’s Cory Lopez (72). France’s Pauline Roussin-Bouchard (71) was another shot back. Ji took a five-shot lead into the final round, but saw it quickly cut to three when Pineau eagled the par-5 opening hole. The lead fluctuated between three and five for the rest of the front nine, narrowing to three again when Ji bogeyed No.9. It remained that way for two more holes before Pineau blinked with a bogey at No.12, while Ji stroked home a 6-foot par save. “From then on, it just felt comfortable,” Ji said. Three more Pineau bogeys followed, sealing the outcome. Pineau wound up carding a 72, leaving him at 9-under 275. Belgium’s Adrien Dumont de Chassart was another stroke back after a 71 – his second top-3 finish in three Junior Orange Bowl visits. Defending champion Karl Vilips of Australia tied for seventh, recovering from a tough start to produce a 69-69 finish. The JOBI still has yet to see a multiple winner on the boys’ side.